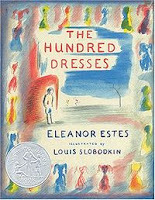 Smother Goose: "The Hundred Dresses"
There are no hundred dresses, not really, and everybody knows it. Wanda Petronski, a poor Polish girl, wears the same shabby blue dress to school every day, although she claims to have a hundred beautiful dresses at home. Her schoolmates mock her claims, torment her about her poverty, hurl abuse at her for being Polish. The story is told from the point of view of one of the bullies, the equally poor Maddie, who would rather see Wanda tortured than herself. Eventually, the bullies lose their favorite punching bag, because Wanda disappears from school. I had misremembered Wanda as dying, which is understandable, because there's not going to be any resolution for her anyway. Wanda's mother sends a note saying that they are moving far away to a big city where no one will make fun of her children ever again (does such a place exist? hmm, maybe she really does die). The cruel classmates learn that Wanda did have a hundred drawings of dresses, and they were exactly as she described them. They feel contrite, but eh, the victim has already moved away, so what can ya do? Estes, Eleanor. The Hundred Dresses. 1944. London: Sandpiper, 1974. I found that book so sad as a child. I really felt sorry for that little girl and wondered for a long time what happened to her. Funny how the boundary between fiction and reality blurs for children.